The federal government began legalizing almost three million illegal aliens 10 years ago, on May 5, 1987, wary of the fiscal liabilities of opening more public assistance programs to a population with high needs and low taxpaying power. To ease the burden on the states, Washington closed some programs to the newly legalized for five years and reimbursed the states nearly $3.5 billion for some of their aid costs. Accounted for an estimated $102.1 billion costs in current dollars in twenty federal, state, and local assistance programs and services. Paid total taxes of $78 billion, for a ten-year fiscal deficit of $24 billion in the public assistance and services portion of the budget. Job Displacement: About 1.66 million legalized workers, 70 percent of them unskilled, displaced an average of 187,000 citizen and settled immigrant workers from jobs each year. Costs of public assistance to those displaced totaled $9.9 billion for the decade. Citizen Children: Women in the legalized population had an estimated 1.25 million U.S. citizen children between 1970 and 1996. Public education and three major public assistance programs to citizen children 18 and under amounted to $36.1 billion in the decade since amnesty. School Costs of Undocumented Children: Remaining in the households of legalized population, or joining them subsequently were some 400,000 illegal immigrants by 1996, up from 177,000 in 1987. 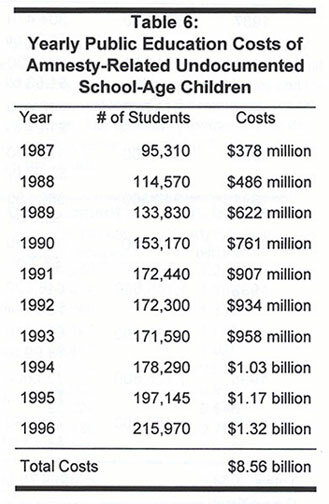 Costs of providing public schooling for them was $8.56 billion. Five-Year Prospective Education Costs: Public education costs for U.S. citizen children of legalized aliens are projected to claim an additional $29.4 billion in the five years from 1997 to 2001, mostly from state and local budgets. Total direct and associated indirect costs of the legalized population after taxes reached $78.7 billion in current dollars for the decade. Large numbers of the legalized began to naturalize starting in 1995. According to the U.S. commission on Immigration Reform, 1.4 million spouses, children, and parents of amnestied aliens now on immigration waiting lists, will gain immediate entry as relatives of citizens. The costs of public education for the young people of this population and medical care and income support for the 900,000 aging parents is expected to be formidable. The Immigration Reform and Control Act (IRCA) of 1986 set the stage for the country's first and so far only experiment with offering amnesty to a mass population of illegal aliens. The paperwork — the actual adjudication of more than three million applications for legalization began a decade ago, on May 5, 1987. The choice of "Cinco de Mayo," an important Mexican holiday, as the starting date was a recognition that the amnesty would be a predominantly Latino affair. More than 85 percent of the 2.7 million ultimately legalized were from Latin American countries. Mexico and Central America alone supplied nearly 84 percent of all legalizations. 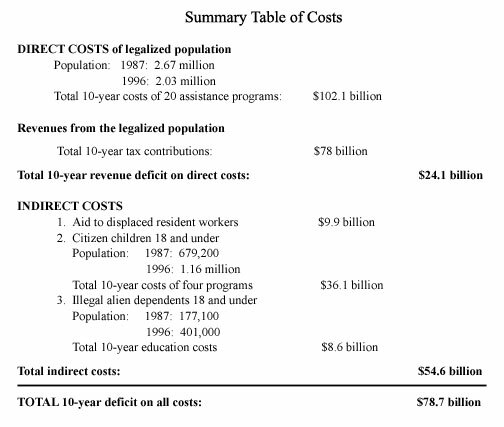 Congress consistently showed concern about the high public assistance costs of legalizing this alien population in debates of immigration reform before the 1986 act. The educational deficiencies, poor language skills, and weak earning power of most of the amnesty population presented a particularly serious liability to state and local governments. The lawmakers' concern was justified. In the ten years since amnesty the legalized population has received direct government benefits in 20 programs worth $102.1 billion, but paid total taxes of only $78 billion. Indirect costs associated with the legalized population such as job displacement and assistance and services to their minor children had reached $54.6 billion by the end of 1996. The total fiscal deficit on all direct and indirect costs is for the decade is $78.7 billion. The amnestied population brought little human capital. By 1992, just 36 percent of amnestied adults reported being able to speak English well. The figure for the Mexican majority was only 27 percent. Only 28 percent of the legalized aliens over 24 were high school graduates, compared to 78 percent of native U.S. Hispanics; 55 percent of the amnesty adults had never eyen entered high school. Average wages for those legalized by the general amnesty working in private sector non-farm jobs in 1992 were nearly 16% lower than the national average. The gap was even greater for those entering under the farm worker amnesty. In 1989 they trailed the average wages of general amnesty workers by 12 to 14 percent.1 According to 1991 data, median yearly individual earnings for legalized workers, $12,670 a year, were 26 percent below those of all U.S.workers.2 Indeed, this study may overstate the earnings of the amnesty population, as most of the major studies and surveys consulted use data from the 60 percent of the legalized population that qualified through the general amnesty. Important to the ultimate compromise that cleared the way for the 1986 act was a federal commitment to bar legalized aliens for five years from use of certain cash assistance programs. Left by Congress to determine the programs to be closed, the Justice Department, under heavy pressure from immigrant and welfare lobbies, ended up barring only Aid to Families with Dependent Children (AFDC) and, partially, Food Stamps and Medicaid. The extensive conditions and exceptions attached to the ban nullified much of the potential savings. Legalized children remained eligible for the state-paid portion of AFDC, and citizen children in mixed households remained fully eligible. Medicaid remained available for many children, the aged, blind, disabled, the pregnant, and medical "emergencies." Food Stamps were still available to the aged, blind and disabled and to legalized farm workers. A major sweetener to the states in IRCA was the State Legalization Assistance Impact Assistance Grants (SLIAG), which reimbursed state and local governments for some of their costs of public assistance, education and public health services for the legalized. In seven years of operation up to SLIAG's end in 1994, state and local governments received a total of $3.5 billion in federal reimbursements, an average of $1,167 per eligible alien. SLIAG reimbursement was paltry compared to the massive needs of a highly dependent population of almost 3 million. Annual federal contributions for each eligible alien under SLIAG works out to $167 a year — about 4 percent of the cost of educating just one alien child for one year in the public school system. 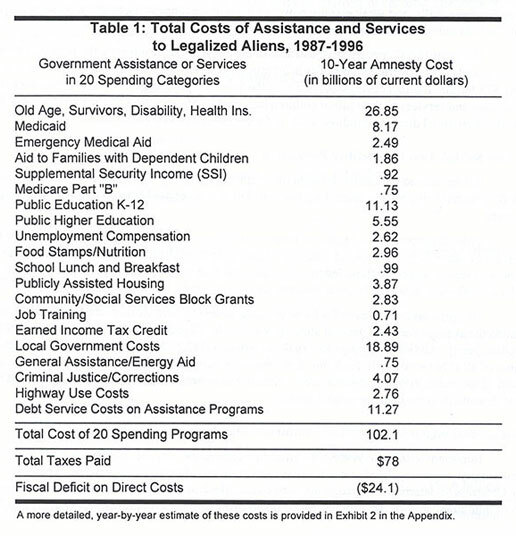 The following table details the estimated costs of 20 major federal, state and local public assistance and service programs used during the past decade by formerly illegal aliens amnestied in 1987. Costs of services to U.S.-born and undocumented children are not included. Clearly, under existing ground-rules, some of the costs would have been incurred if there had been no legalization. Illegal aliens are eligible for public elementary and secondary education, Social Security, community development and social service grant-based programs, corrections, highway use (though some states do deny them driver's licenses) and, in some cases, housing. But most of the costs listed here could have been avoided if Washington, rather than grant amnesty in 1986, had chosen instead an aggressive program of removal of illegal aliens and tighter prohibitions on their use of social services. For the 83 percent segment from Mexico and Central America, the gap between their average wages and the U.S. average actually increased between 1987 and 1992. Wage differentials alone understate the earnings gap. More revealing is that in 1991 the family incomes of the legalized were fully 46.6 percent lower than the average of all families. Worth asking is whether they are agents or victims in the growing earnings gap between U .S .Hispanics and the rest of the nation. Overall, the income of Hispanic households has dropped 14 percent between 1989 and 1995. The following table (Table 2) of the legalized population's 10-year tax payments shows lower proportions of contributions going to state and local income taxes than in the case of all taxpayers, and a higher proportion going to sales, excise and payroll taxes, that are more regressive and more difficult to evade. Methods used in estimating payments under each of these tax categories appears in the Appendix. The legalized population has generated costs indirectly through displacement from jobs of U.S. residents, through the U.S. citizen children it creates, and through the undocumented minor children it brings to the United States. Job Displacement: Displacement occurs when the addition of unskilled workers to a labor market causes employed workers to be laid off, work shorter hours or fewer weeks a year, spend longer periods of time in job searches, move to another labor market, or drop out of the labor force altogether. Wage depression is also often a result of the influx of low-expectation workers into an area. This study does not attempt to measure the wage depressing effects of amnestied workers, though falling wages can often be the trigger for replacement of established workers with less demanding newcomers. This study estimates the initial displacement rate at 25 percent: the departure of 25 resident workers for every 100 low-skill new workers entering the labor market. However, it recognizes that the displacing effect of a specific cohort of immigrant workers wanes with time, as both they and the workers they displace acquire skills that make them more employable, and as the immigrant cohort shrinks because such factors as death, retirement or emigration. The appendix provides a more detailed explanation of estimating job displacement and its public sector costs. Table 3, which follows, summarizes the amnesty-related job displacement over the decade. 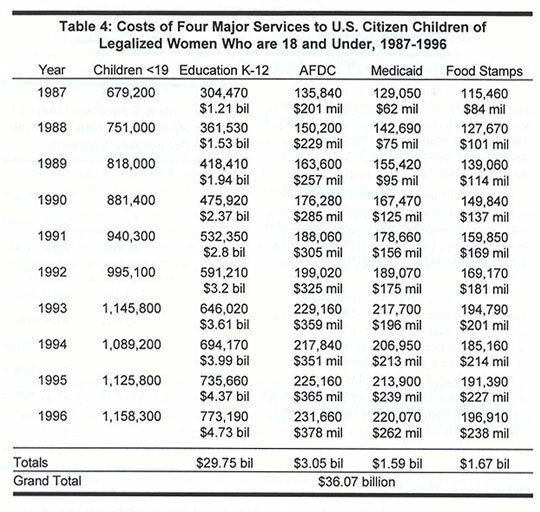 Costs of U.S. Citizen Children of the Amnesty Population: Women in the legalized population are estimated to have given birth to 1.25 million children in the United States since 1970. This study considers the cost of the sub-population comprising those citizen children who were under 19 years old at some period between January 1, 1987 and December 31, 1996. Estimates of their numbers and ages depend on estimates of the year-to-year growth in the United States since 1970 the female illegal alien population that ultimately was legalized beginning in 1988. The Appendix and Exhibit 7 explain the method of counting in more detail. Like any other residents, these children receive a wide range of government services and assistance, either directly, such as public education, or through their families, such as publicly-assisted housing. Table 4 below summarizes the estimated costs of four major programs to citizen children. Costs of educating citizen children of legalized aliens will continue to rise into the next century, as both per-pupil costs and the number of children keeps on growing. Table 5 projects those education costs five years ahead into the new century. School Costs of Undocumented Children: Immigration and Naturalization Service surveys of applicants for legalization indicate that there were about 177,000 undocumented children with legalized adults at the beginning of the amnesty. Estimates derived from the number of spouses and children waiting in 1996 for visas to join legalized relatives suggests that about 404,000 undocumented children under 19 are already residing with legalized relatives, and some 54 percent of them would be using the public schools. 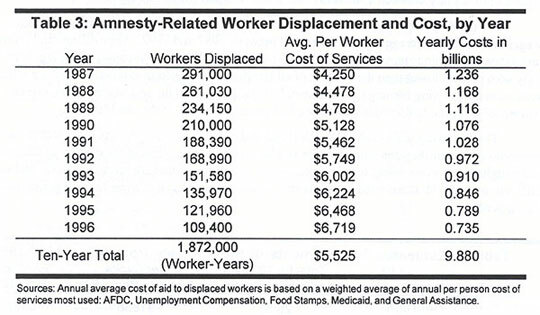 The estimated costs for the decade of education for amnesty-related undocumented children are shown in Table 6. In ten years the United States has paid out $156.7 for the direct and indirect costs of the legalized population, but has received a little more than half that back in taxes — $78 billion. That figure would be substantially higher if expressed in 1996 dollars. The total fiscal deficit of $78.7 billion amounts to a government subsidy to each member of the 1987 legalized population of $29,148. A subsidy of that amount would have enabled most amnesty seekers to establish a farm or business and remain in their home countries. Since the legalization, the pool of illegal immigrants in the country has continued to grow and now exceeds five million; the INS estimates that 420,000 new long-term illegal aliens arrive each year. The churches remain the most outspoken interest group now demanding a new amnesty. So far Congress and the Executive have shown little warmth toward the idea. This new realism is encouraging. In the debates leading up to the 1986 IRCA, a sizable minority in Congress opposed any amnesty until the border was under control. They were overridden. The results were that the amnesty gave legal status to some 300,000 to 400,000 who had entered the U.S. illegally and claimed it fraudulently. With weak border controls, legalization itself became a magnet for additional family reunifications, some of them encouraged by the more secure legal status of the anchor immigrant. Others came, and still come, because they saw the amnesty as a precedent and were convinced that the United States will eventually do it again. The heavy concentration of 53 percent of all legalized aliens and their growing families in one state — California — and their high cost to state and local governments, were major driving forces in the adoption of Proposition 187 in 1994. The fiscal drain also contributed to the congressional mood that culminated in the restrictive federal welfare reform and immigrant responsibility acts of 1996. Certainly, Washington in its present mood would be unlikely to enact an amnesty without far stronger and longer-lasting public assistance restrictions than those adopted in 1987. While another formal amnesty looks unlikely now, the country may expect continuing piecemeal, de facto amnesties by stealth, accomplished through selective enforcement, lenient regulations, and a relaxed deportation effort toward some categories. Meanwhile the creeping dissolution of the boundary lines between citizen and legal alien, and between legal and illegal alien, if unchanged, will make amnesty increasingly irrelevant. 1 Detailed comparisons of the earnings of general amnesty workers and special agricultural workers are sparse. A 1989 survey of the two groups in California showed median family take hope pay was between $400 and $499 for general amnesty workers and between $350 and $399 for farm workers, 12 to 14 percent difference. See: Comprehensive Adult Student Assessment System (CASAS). A Survey of Newly Legalized Persons in California. San Diego: 1989. pp. 5-9. 2 U.S. Department of Labor, Bureau of International Labor Affairs. Characteristics and Labor Market Behavior of the Legalized Population Five Years Following Legalization, Washington: National Technical Information Service, 1996. pp. 19,43, 87, 102. 3 U.S. Department of Labor, Characteristics and Behavior of the Legalized Population Five Years. David Simcox is the former Chairman of the Board of Directors of the Center for Immigration Studies and heads Migration Demographics in Louisville, Ky.